The first female architect in Scotland, she trained at Aberdeen School of Art, 1915-25, and later became an assistant lecturer at Aberdeen Technical College. 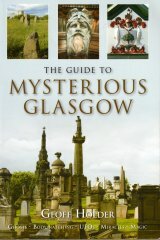 A niece of J J Burnet and the wife of architect T Harold Hughes, she was particularly interested in medieval Scottish architecture and, in 1929, was commissioned to design Glasgow's Mercat Cross. 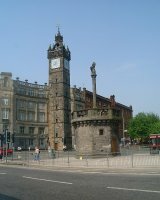 Completed in 1930, the construction of the Mercat Cross brought her briefly into contact with the sculptors Margaret Findlay, who modelled the unicorn which surmounts its central columnn, and Archibald Dawson , who carved it in stone. Dawson also carved the fine, but rarely seen, wooden animals on the building's interior staircase, which were also modelled by Findlay. Outwith Glasgow, Hughes designed Coatbridge War Memorial (1926), and worked with J J Burnet on West Colinton Cottage, Woodhall Road, Edinburgh (c. 1935). She also restored and refitted the Choir and Song Schools at St. Mary's Episcopal Cathedral, Edinburgh (1956-65). Elected ARIBA , 1927, she was placed on the Register of Architects, 1933, and was made an Honorary Fellow of the Royal Incorporation of Architects in Scotland, 1969. She lived and died at Tirranmuir, Kippen, Stirlingshire.